FRISCO, Texas — Patrick Mulick warned everyone. Mulick kicked off the last full day of training at the TSD Conference with the morning keynote presentation. At the outset, he told several hundred attendees that they may need tissues before he would be finished. North Texas in mid-March can trigger its fair share of allergies, but the tearful eyes at the Embassy Suites Dallas Frisco Hotel and Convention Center on Tuesday were due to Mulick’s stirring and poignant address. He refocused attendees on why they are in the business of transporting students with disabilities. “We don’t have time to not be real with each other,” he said. He implored the attendees to be alive in life and to continue making a difference in the lives of the students they transport. The point took on new meaning about an hour and a half later. Mulick first spoke at the TSD Conference in 2016, and ever since he has been a widely popular draw. It was little surprise he packed the room with “The Heart of the Matter,” which he began by asking the attendees to shout back at him, “I’m an educator, and so are you.” He explained that anyone who cares for students is an educator, and the title certainly applies to those who provide transportation to and from school. But student transporters, and human beings in general, get burned out. That happens because people forget why they do what they do. He challenged the audience to consider the perspective of the children they transport. Thoughts impact emotions, which impact behavior that impacts the outcome, Mulick said. Then the water works began. Mulick illustrated the role that advocates play in the lives of students with disabilities via several videos, a few of which showed interviews conducted by special education teacher Chris Ulmer. Ulmer’s videos give a voice to these children by allowing them, in their own words, to describe their hopes and dreams, likes and dislikes. The videos show the children as what they are, children, and shatter the disability label by revealing each child’s personality. Editor’s Note: Ulmer’s YouTube channel is Special Books by Special Kids. Mulick said all people have disabilities, or special needs, but most people aren’t judged by them, because they are largely invisible. Many students with disabilities don’t have that luxury. He illustrated the point with a group exercise, where attendees introduced themselves to each other not by name, but by something they are not good at. “We all have a deficit. What we need to remember is that we aren’t that different from those who we support, but we can hide them with our strengths,” explained Mulick. He also implored the audience to take the time to get to know their students and their interests. Doing so can unlock their potential. and lead to transformational, life-long growth and achievement. Mulick also discussed how the attendees can color their language differently in describing the students they serve, putting the person first, rather than the disability or behavior. A common term used, for example, is differently-abled, rather than disabled. That said, he added that these children are best served by ensuring that they know and recognize what their challenges are, so they can learn to advocate for themselves. 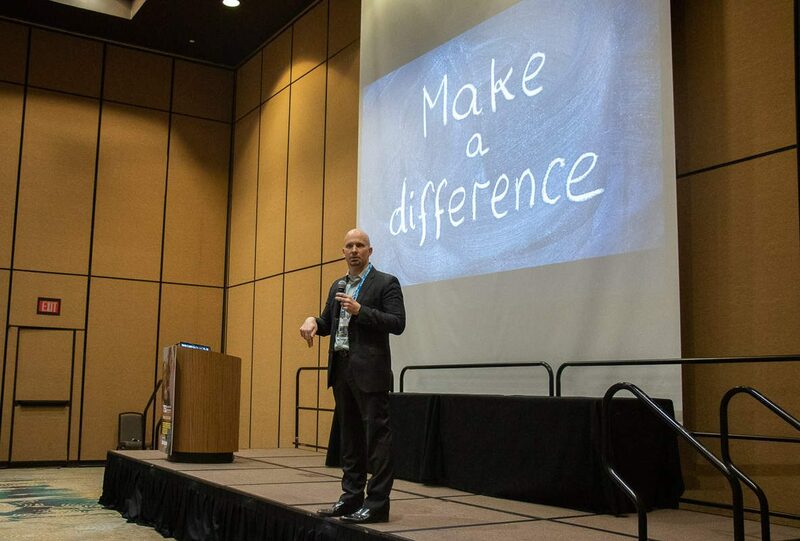 At the end of his talk, Mulick discussed a “transformational” moment in his life, when in January 2018, while being invited to speak at the 2018 TSD Conference, Mulick was diagnosed with inoperable non-Hodgkin’s lymphoma. He was declared cancer-free in August after 600 hours of intense chemotherapy, which left him temporarily disabled and relying on a team of medical staff, family and friends to survive. He said most of us are all temporarily-abled, and he pointed out that the dignity and respect we would want when we have to rely on others, for example in old age, is what student transporters are giving children, today. 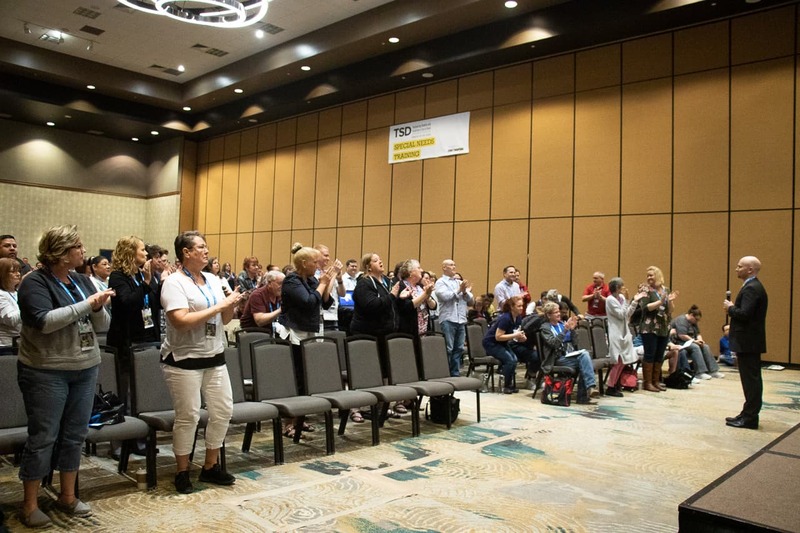 Autism and behavior specialist Patrick Mulick received a standing ovation after his March 19, 2019 keynote address at the TSD Conference in Frisco, Texas.